The last place to visit on this trip, Kakadu national park. Compared to the Gibb river road the riding isn’t anywhere near as challenging since most of it is sealed. But Kakadu makes up for that ten-fold on other things. It is world heritage listed for both its nature and living Aboriginal culture. It has Aboriginal rock art of over ten thousand years old and the “bathroom” with the most spectacular view ever. We only spend about 4 days there but it was well worth it. I’d recommend it to everyone if you are anywhere near Darwin. Yeah yeah… sounding like a tourist guide again, I know. The “bathroom” with the best view, is a series of rock pools at the top of the Gunlom waterfall. 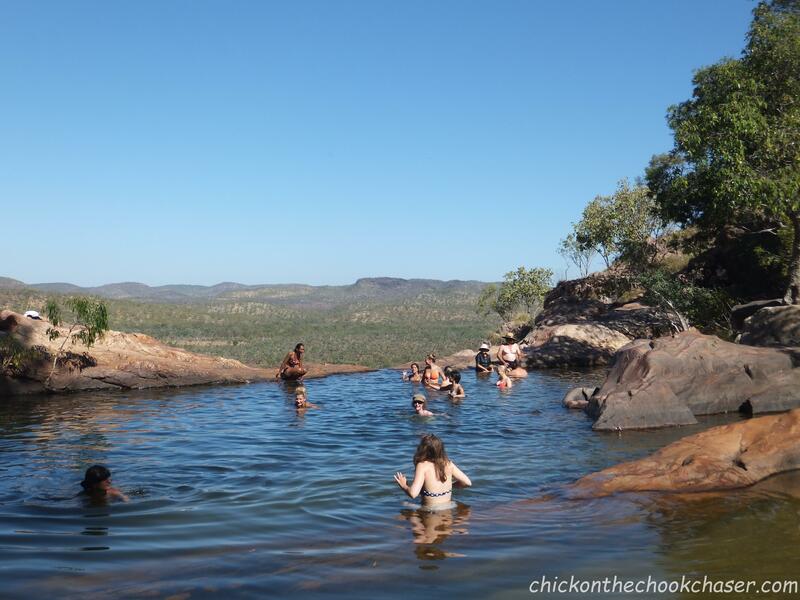 After a short climb up you can jump in the water and enjoy a skyscraper like view of the intense green colours of Kakadu. Another incredible place to visit is Ubir. 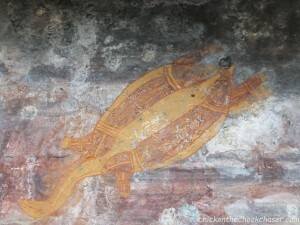 This historical site has several natural galleries with Aboriginal rock art. It also provides a great spot to watch to sun setting over the flood plains. The colours of the sky unmatched. Then there was the wildlife. On one of our walks I was showing extreme interest in some average looking bird when Lisette yelled: “Croc! !” Yeah right, you’re joking, no really! There he was, at least 4 meters long, quietly floating by, a real salt water croc! If it wasn’t for Lisette I wouldn’t have seen half of the wild we saw. 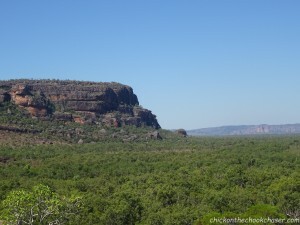 A nice thing about Kakadu is that the park organizes free guided tours. We were lucky enough to have an incredibly passionate ranger, Christian (if you go there, make sure you see him), educating us on Aboriginal culture. Since, for a long time, only a few white people made it into this part of Australia the culture is still well pres erved. The people still speak the language and the wealth of knowledge about nature and so many other things is still present. 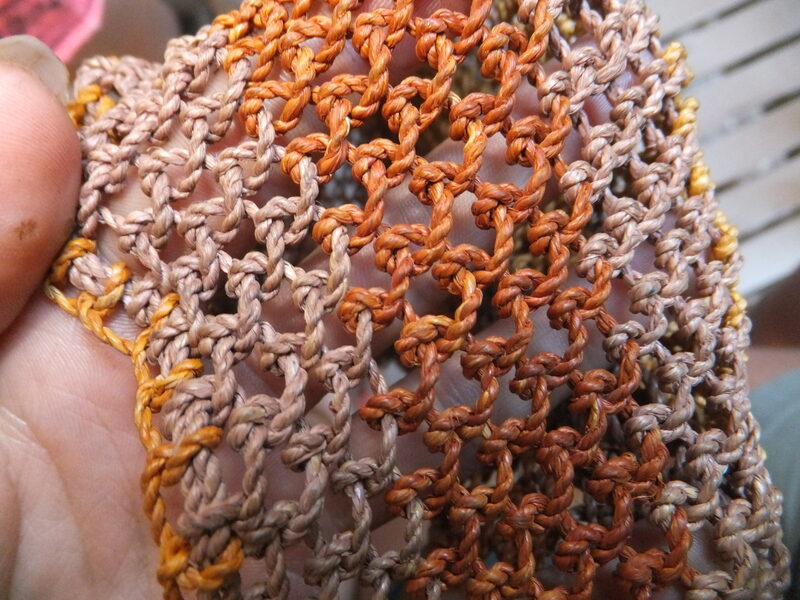 Two Aboriginal women taught a group of tourist about their traditional weaving. 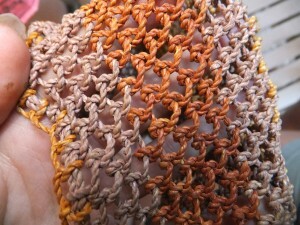 Of the group, only two tourist were able to split one Pandanus leaf (to weave with) in an hour, while these women, highly amused, split 30 leaves per minute. Their skills and knowledge far beyond any of the tourist around. It was a great and humbling experience to be able to learn from them and spend time on their land.